Born in Tampa, Florida, on October 4, 1944, to Anthony and Olivia (Cuervo) La Russa, Anthony Jr's paternal grandparents had emigrated from Sicily and his mother’s family from Spain. He was raised in Ybor City, where his parents had met while both were working in the local cigar factory. 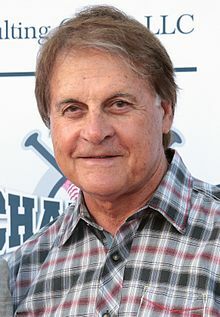 Growing up, The La Russa family later moved to West Tampa, where Tony played American Legion baseball and PONY League baseball alongside teammate Lou Piniella. 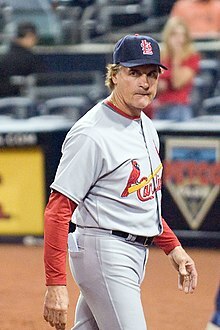 After graduating from Jefferson High School in Tampa, La Russa was signed by the Kansas City Athletics in June, 1962 as a middle infielder, with a clause to pay for his college education. 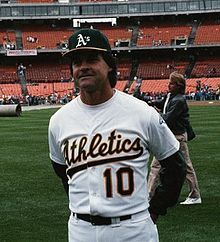 La Russa made his major league debut on May 10, 1963, after having played 76 games with A's affiliates Binghamton Triplets and Daytona Beach Islanders in 1962. He spent the entire 1963 season in the majors, as was required by his signing as a "bonus baby." He had suffered an off-season shoulder injury while playing softball with friends, and this limited him to only 34 games in 1963, in which he hit .250. The injured shoulder bothered him through the remainder of his playing career. ^ Bodley, Hal; Will, George (2014-05-01). How Baseball Explains America. ISBN 9781623688073. ^ "The Man in the Dugout". Computer Gaming World. April 1993. p. 10. Retrieved 6 July 2014. ^ Bluestone, Jillian. "La Russa's Loophole: Trademark Infringement Lawsuits and Social Networks". Villanova University School of Law. Jeffery S. Moorad Sports Law Journal. Retrieved 28 February 2015. 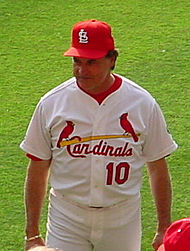 Wikimedia Commons has media related to Tony La Russa.